Chapter 510, an Oakland-based youth literacy project, is opening its first community writing center, fronted by a Department of Make Believe. Tavia Stewart-Streit (left) and Janet Heller hope to flip bureaucracy on its head. 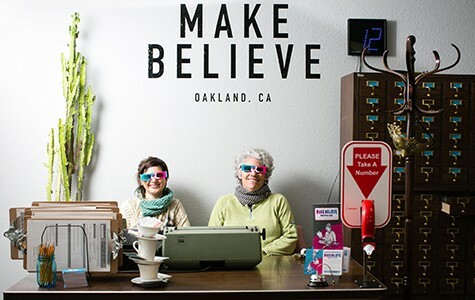 The Department of Make Believe (2301 Telegraph Ave., Oakland) will have its grand opening on Fri., Dec. 4, at 5 p.m. Free. Chapter510.org. Last week, the front of Chapter 510's newly acquired home, an old church on the corner of Telegraph and 23rd Street, looked like any non-descript business about to open — complete with notices taped to the windows. But on closer inspection, the signage revealed an atypical whimsicality: "'Public Notice of Application to Make Believe' ... issued by the Department of Dreams." Chapter 510 is a small, volunteer-fueled youth organization that helps underserved Oakland students learn how to research, write, and publish books. Soon, it will open its first headquarters, where it will expand its in-school programming to afterschool hours. And to help fund the organization, the center will welcome students into an imaginative retail space, called The Department of Make Believe. Chapter 510 was started in 2013 by Janet Heller (a long-time educator and founder of WritersCorps), with support from a group of Oakland librarians, educators, artists, and writers who were interested in bringing a literacy project in the vein of 826 Valencia to the East Bay. Also known as the Pirate Supply Store, 826 Valencia is a youth writing center located at its titular address in San Francisco's Mission District and was founded in 2002 by author Dave Eggers. Eggers aimed to create a resource that brought in writers and educators as volunteers to give one-on-one tutoring attention to struggling children in the Bay Area. To conform with the retail requirement for the space he had acquired, he and his team turned the front of the center into a playful pirate-themed shop that would draw in children and transform their attitudes toward homework. The model worked so well that it caught on, resulting in Brooklyn Superhero Supply, LA's Time Travel Mart, and many other iterations of the pairing. Until now, Chapter 510 had focused on developing its own programs that utilize the effectiveness of one-on-one attention but are specifically tailored for Oakland youth. Currently, its team of approximately 25 volunteers is working with all grade levels of students at MetWest High School, North Oakland Community Charter School, and Acorn Woodland Elementary School offering tutoring during the day and helping with Community Action Research Projects as part of the curricula. In addition, they publish books written by and for Oakland youth to encourage literacy. "We really feel a sense of urgency based on what our students are telling us," said Heller. "They don't have time to write, they want relationships with adults, they need our help ... teachers are stretched." Heller was the sole full-time staff member of Chapter510 until Tavia Stewart-Streit joined her this past February. For ten years, Stewart-Streit was at NaNoWriMo (National Novel Writing Month), an organization that helps writers produce books. She originally moved to the Bay Area to volunteer at 826 Valencia. Together, the pair rallied to expand Chapter510, and started a 510 fundraising campaign that launched on May 10, 2014 and aims to raise $510,000 (through 510 donations of $51 or more) in 510 days, plus log 5,100 volunteer hours. Tavia Stewart-Streit (left) and Janet Heller. Heller and Stewart-Streit planned to find a building after raising the money, but as they were working out of their former office space in Rock Paper Scissors Collective, an opportunity fell in their laps. Two architects, Erik Bloom and Todd Bennett, together known as Parcel Projects, had come by to introduce themselves as new neighbors after purchasing the former church across the street in hopes of transforming it into a community center housing local organizations. A few months later, Heller and Stewart-Streit moved Chapter 510 into the largest portion of the 8,000 square foot building — happy to have found a perfect home, but with only a portion of their campaign money raised. To push for the next round of donations, they launched an Indiegogo campaign earlier this week. The Department of Make Believe will also help raise funds by offering products assembled in-house, the profits from which will go directly back into the organization's programming. Products will include licenses to dream, permits to make believe, worry containment units (tubes), instant serenity (ear plugs), intention candles, imaginary friend food, dreams masks (for night and day), and a curated selection of books in multiple languages. Although many of the items are simple products, the sharply designed packaging (created by E.M. Wolfman Small Interest Bookstore owner Justin Carder with ideas that came out of a public design charrette), transforms them into inspirational keepsakes. 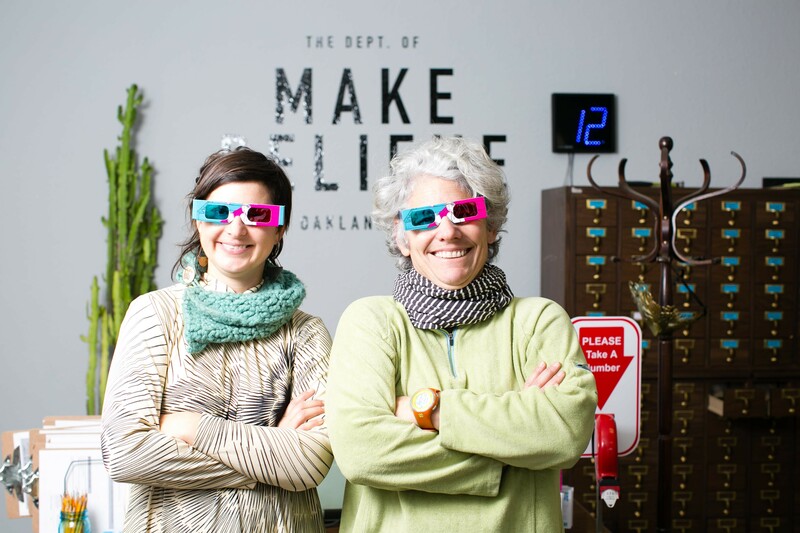 "We want to inspire not only our students to create, but everyone in Oakland," said Stewart-Streit. "This is a store to come buy things to help you connect with that part of yourself that used to make believe all the time and play pretend." Chapter 510 will open its retail store with a grand opening party this Friday at 6 p.m. The writing center will gradually open up to the public for programming, but won't be running full steam until after renovations take place in February. Eventually, the whole building will host the Oakland Book Festival, a community food project, and other local artists and nonprofits. Once open, the center will offer free writing and bookmaking workshops, afterschool drop-in tutoring for K-12 students, professional training in publishing for high school students, access to free books, and a community space for young writers. But Heller and Stewart-Streit also want the center to morph continuously, in reaction to needs and desires expressed by students and community members. "People say all the time, 'I'm so surprised this hasn't happened already,' just because Oakland needs this so bad," said Heller. "There's so many talented, young voices and lots of really important things to say. So it's just really exciting to see what's already been said and what's going to be written through our programs."